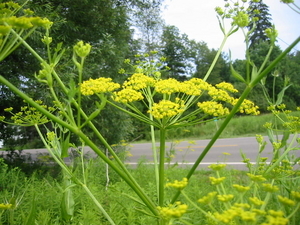 Wild parsnip is a herbaceous monocarpic perennial. It grows as a rosette for at least a year. Flowering stems are hollow, grooved, and up to 5' tall. Leaves: Leaves have toothed leaves and upper leaves are reduced to narrow bracts. Fruits & Seeds: Seeds are yellow. They are smooth on one side and have four curved ribs on the other side. Roots: Has long thick taproots. 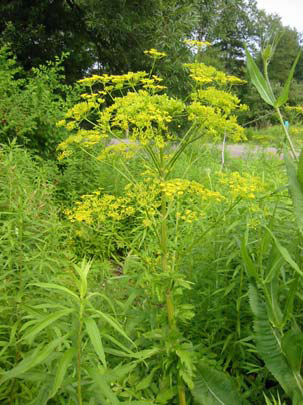 Wild parsnip invades oak savannas, prairies, fields, pastures, and roadsides. It has a broad habitat tolerance. It will grow in dry, mesic, or wet habitats but it wont grow in dense shade. CAUTION When sap contacts skin in the presence of sunlight, it can cause severe rashes, blisters, and discoloration of the skin. Wear gloves, long sleeves, and long pants when handling.